This year has been one for the books in cruising, especially for Carnival Cruise Line. From a new ship added to the fleet to the announcement of the complete makeover of two current ships, Carnival has had a busy year making changes and trying to improve the cruise experience. Before, anyone caught smoking on a balcony was charged a cleaning fee. Now, guilty smokers caught breaking the rules face a $500 fine and the possibility of being kicked off the ship at the next port of call. Any roommates would be kicked off too, so make sure your friends and family only smoke in the safe, designated smoking areas. Carnival’s social plan, the most popular and accessible WiFi plan available, increased in price from $5 to $8 per day, or from $4 to $6.80 if purchased in advance. Despite the price hike, the plan continues to be wildly popular among cruisers looking to stay connecting to social media at sea. Carnival started off its West Coast push in 2018 by announcing that its upcoming ship Carnival Panorama will head straight to the Long Beach Cruise Terminal directly from its Italian shipyard, making it the first brand new Carnival ship deployed to Southern California in 20 years. This announcement came the same day the line revealed the results of a 10-month renovation project to the Long Beach terminal as well as announced plans to invest millions of dollars into a port development project for Ensenada, a featured port on Mexican Riviera cruises sailing from Long Beach. Finally, just last week Carnival also announced that in 2020 the line will sail from San Francisco for the first time ever after redirecting Carnival Miracle there. For the first time in a long time, Carnival increased the price of its steakhouse restaurant, though only by $3. Previously $35, the multi-course fine-dining venue now costs $38 per person. Perhaps a bigger upset was when the cheesecake was removed from the dessert menu, causing such an uproar that Carnival brought it back. In another price increase, the cost of gratuities increased by just over a dollar this year. Despite some expected initial backlash, the new cost of gratuities – which are charged per person per day – puts Carnival more on par with its competitors’ gratuity pricing. Almost overnight, Carnival reduced the drink value limit from $50 to $20 on alcoholic drinks included in its Cheers beverage package. However, the truth is not many drinks were affected by this change, except for a few select wines and whiskies valued at more than $20 per pour. Cruisers can rest easy knowing the vast majority of their favorite beverages are still covered under the Cheers package. 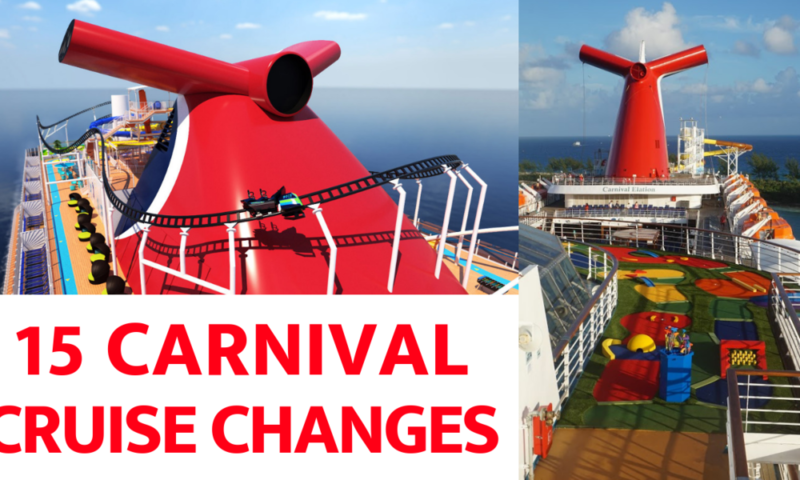 Following in the footsteps of sister ship Carnival Sunshine, Carnival Radiance and Carnival Sunrise (currently known as Carnival Victory and Carnival Triumph) will soon emerge as “new” ships in Carnival’s fleet after their respective dry dock makeovers. As part of Carnival’s $2 billion fleet wide enhancement program, the ships will undergo bow-to-stern refurbishments over 2-month dry docks in Spain in 2019 (Sunrise) and 2020 (Radiance). Carnival Radiance and Carnival Sunrise will then debut with new and improved accommodations, dining venues, entertainment, and more. In an industry first, Carnival recently announced that the first ship in its upcoming XL class, Mardi Gras, will feature the world’s first roller coaster on a cruise ship. Set 187 feet above sea level, passenger-controlled vehicles able to travel up to 40 miles per hour over the winding, twisting track will offer personalized rides to each cruiser willing to dare the course. As of January 1, 2018, the price of the popular Cheers package increased $2 per day, bringing it to $51.95 per person per day when booked before sailing or $56.95 if purchased onboard the ship. Despite the slight increase in cost, Carnival’s all-inclusive Cheers beverage package still remains as one of the most competitively priced and inclusive beverage programs available at sea. While Carnival argues that the Faster to the Fun (FTTF) program as a whole only increased once this year, it’s true that the cruise line has increased the program’s cost multiple times – at least for certain ships and certain cruise lengths. Once $50 per stateroom to purchase, the FTTF program is now charged based on the length of the cruise and on the particular ship you’re cruising on. At its lowest, FTTF costs $49.95 per stateroom for a 3-day cruise, excluding cruises on Carnival Liberty. At its most expensive, FTTF will run you $119.95 per stateroom for an 8-day cruise on Carnival Horizon. However, with perks like priority embarkation and debarkation, priority tendering, priority luggage service, priority dining reservations, and more, the program continues to sell out almost immediately despite the additional cost. When Carnival Radiance emerges from her 2-month, $200 million dry dock in 2020, she will be the first ship in the Carnival fleet to feature the new “Big Chicken” restaurant. As a creation of the line’s Chief Fun Officer (CFO) and former NBA Hall-of-Famer Shaquille O’Neal, the complimentary venue will primarily serve fried chicken sandwiches, including chicken-and-egg biscuits for breakfast. This year we met Carnival Horizon, the line’s newest ship. Introducing things like Guy’s Pig & Anchor Smokehouse | Brewhouse, smart elevators, a Dr. Seuss WaterWorks, and Bonsai Teppanyaki, the ship certainly made a big entrance into the cruise industry, even among competitor ships introducing things like onboard racetracks. Basically overnight and almost without warning, Carnival raised the gratuities on the Cheers beverage package to 18%, up from 15%. While the increase seems minimal, amounting to only about $11 per person for a 7-day cruise, the increase has cruisers divided, with some upset by the change and some shrugging it off that the new percentage is on par with the competition. Earlier this year, Carnival began testing onboard pizza delivery through the HUB app on Carnival Horizon. Thanks to a new app update pushed in late December, this convenient food service is now available on Carnival Victory, Breeze, Magic, and Conquest as well, with a note saying that more ships will be added soon. The app update also allows users to check-in for their cruise from their mobile device, share their cruise countdown on social media, and book and pay for things like excursions, drink packages, spa treatments, and more. In an effort to quell the buffet crowds on embarkation day, Carnival recently started offering lunch in the main dining room. The lunch is available only to families, as noted by the “Family Zone Lunch” sign posted outside the dining room, and is set up like a buffet, meaning there are no waiters serving like one would expect in the dining room. This way, crowds are dispersed among the lido deck and main dining rooms, but the wait staff is still free to attend to their normal embarkation day duties.